Ever had a food that goes along with everything? Here, everything includes actually everything. A food that goes along with chicken, mutton, legumes, potatoes and every kind of vegetable, pickle of every kind, any dairy product, pork, spinach, tea and even alcohol. Every Nepali must be nodding their head right now. Yes, we’ve had it. It’s Chiura, the beaten rice. Chiura is sometimes the breakfast, sometimes lunch or dinner and sometimes all in a Nepali home. It is light, calorie free, easy to eat, carry and make. Be it a festival or a ordinary day in our country, chiura is always loved. It is mostly used in a Newari community where a voj(party) without baji(chiura) is considered incomplete. It is a “must” dish. The rice grains are washed with clean water. The wet grains are fried. Then the fried grains are beaten or simply processed by a machine. 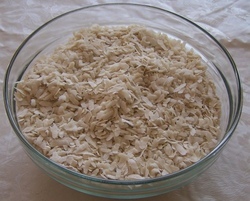 The beaten rice is ready to be eaten. Thus prepared Chiura can be fried in oil/ghee and mixed together with nuts, dried chillies, fried ginger and anything according to choice and it turns out to be a wonderful way of passing time. Similarly, it can be fried and then boiled with milk to make a chiura pudding. For spice haters, it can be fried plain without using ghee or oil so that the chewing it easy. So, when are you trying this amazing food?